Odontomas are the most common odontogenic tumors arising from the growth of completely differentiated epithelial and mesenchymal cells which gives rise to ameloblasts and odontoblasts. However, they are not considered as true neoplastic lesions and thus referred as hamartomas or odontogenic tissue malformations. The etiology of odontome is unknown. Various predisposing factors may include local trauma, genetic mutation, and infection. Odontomas may also be linked to syndromes such as Gardner's syndrome or Hermann's syndrome. Odontomas are of two types: compound odontoma and complex odontoma. Complex odontomas are of rare occurrence, with a female predilection. The site of occurrence is generally first–second mandibular molar region. They rarely erupt into the oral cavity as they lack periodontal ligament. Thus, the usual treatment option for complex odontoma is surgical excision. The present case report illustrates a treated case of complex odontoma which was found to be associated with agenesis of an adjacent molar tooth. 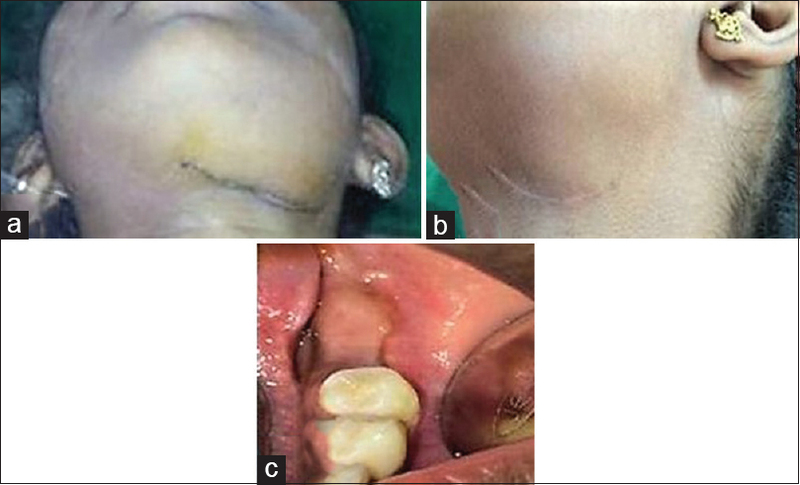 An 11-year-old female patient presented to the department of pedodontics and preventive dentistry with a chief complaint of extraoral swelling on the left side of the face at the lower border, near the angle of the mandible. The history of presenting illness revealed that the swelling had been present for the past 6 months and had mildly increased in size for the past 2 months. The swelling had been asymptomatic. Extraoral examination revealed mild facial asymmetry and a hard nodular mass which was nontender on palpation. The skin overlying it was normal with no signs of inflammation or ulceration [Figure 1]a. Intraoral examination revealed the presence of permanent dentition with missing left permanent mandibular first molar (36). No obliteration of buccal vestibule was noted and mucosa overlying missing first molar tooth was normal [Figure 1]b. Orthopantomograph revealed a large radiodense mass with a lucent rim on the left side of the posterior mandible overlying the unerupted molar tooth which was assumed to be tooth 36. The mass was lying just over the erupting path of the tooth 36 acting as a hard tissue barrier for its eruption. Radiographically, it was also observed that the left permanent mandibular second molar (37) was missing [Figure 1]c. A provisional diagnosis of complex odontoma was made. A decision to surgically excise the mass under general anesthesia was made with doubtful preservation of the unerupted molar tooth, followed by histopathological examination to confirm the diagnosis. Informed consent was taken from the parents to carry out the procedure under general anesthesia. 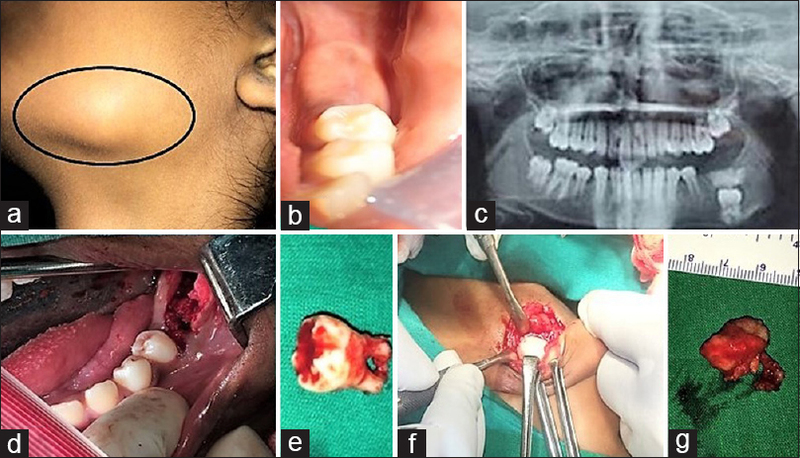 Following a complete pediatric and anesthetic evaluation, tooth 36 was removed via extraoral approach using submandibular incision [Figure 1]d and [Figure 1]e. Platelet-rich plasma (PRP) was inserted in the socket and skin sutures using 4–0 prolene were placed. Excision of the hard tissue mass was done through an intraoral approach [Figure 1]f and [Figure 1]g, following which PRP and sutures were placed. The hard-tissue mass along with the first molar tooth was sent for histopathological examination. The extracted tooth was identified as 36 based on the morphology of the crown, and based on the histological findings, a definitive diagnosis suggestive of complex odontoma was made [Figure 2]. The postoperative course was uneventful. In the 3rd month of follow-up, the patient reported no signs of discomfort or pain [Figure 3]. The patient continues to be under follow-up and prosthetic replacement of missing molars is planned for future. Although complex odontoma usually presents as an asymptomatic lesion, it may be sometimes associated with one or more pathological changes. In the present case, the patient presented with mild facial asymmetry, a small extraoral swelling, and clinically missing 36. Radiographic appearance of complex odontoma is determined by developmental stage and degree of mineralization. In the present case, the lesion was in third stage, which is described as a completely radio-opaque lesion (masses of dental tissues) with a radiolucent surrounding zone (connective tissue capsule). Odontomas commonly present closely associated to adjacent teeth, but are separated by septum of bone. Very few cases reported fusion of complex odontomas to the associated tooth of normal morphology. In the present case, odontoma was separated from the tooth by a septum of the follicle. The differential diagnosis of complex odontoma include cementoblastoma, osteoid osteoma, and fibro-osseous lesions, such as cemento-ossifying fibroma., All these conditions can be differentiated due to their distinct radiographic appearance. Most importantly, none of these are associated with impacted tooth. Periapical cemento-osseous dysplasia which is solitary with dense radiopacities and a radiolucent rim is another differential diagnosis. However, these are located deep in the alveolar bone whereas complex odontoma is situated in the alveolus toward the crest of the ridge, as seen in our case. Furthermore, periapical cemento-osseous dysplasia is not associated with the unerupted tooth. Removal of the odontoma mass in the primary operation results in eruption of the unerupted tooth in 45% of the cases. The various factors which decide the fate of the unerupted tooth are morphology of the tooth, location in the jaw, age of the patient, and space available in the dental arch. In the present case, the associated tooth was positioned too low in relation to lower border of the mandible, root closure was complete, and a dense layer of bone covering was present above it. Thus, the unerupted tooth was removed along with odontoma. An interesting finding of the present case was association of the odontoma with agenesis of 37. This type of occurrence where odontoma is associated with one or more missing contiguous teeth is rare. Histologically, complex odontoma appears as a mass of disorganized tissues of odontogenic tissues. Cementum-like substances and dentinoid structures are intermixed. 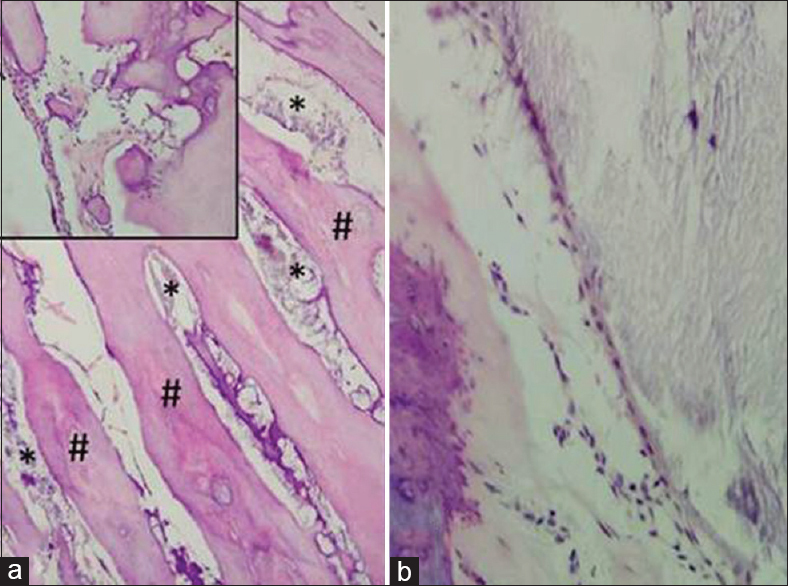 Pulp tissue, epithelial remnants, and enamel matrix can also be observed within the calcified mineralized masses. The present case revealed similar findings, thus confirming the provisional diagnosis made at the time of the treatment. Adequate knowledge of clinical characteristics is necessary to establish proper diagnosis and management of odontomas. The present case of complex odontoma is unique because of its association with agenesis of permanent mandibular second molar. The authors certify that they have obtained all appropriate patient consent forms. In the form, the patient's parents have given their consent for images and other clinical information of the patient to be reported in the journal. The patient's parents understand that the name and initials of the patient will not be published and due efforts will be made to conceal identity, but anonymity cannot be guaranteed. Bengtson CR, Bengtson AL, Bengtson NG. Therapeutic procedure odontoma in childhood: Report of a case. Arch Oral Res 2013;9:97-103. Satish V, Prabhadevi MC, Sharma R. Odontome: A Brief overview. Int J Clin Pediatr Dent 2011;4:177-85. Pacifici A, Carbone D, Marini R, Pacifici L. Surgical management of compound odontoma associated with unerupted tooth. Case Rep Dent 2015;2015:902618.
de Oliveira BH, Campos V, Marçal S. Compound odontoma – Diagnosis and treatment: Three case reports. Pediatr Dent 2001;23:151-7. Bagewadi SB, Kukreja R, Suma GN, Yadav B, Sharma H. Unusually large erupted complex odontoma: A rare case report. Imaging Sci Dent 2015;45:49-54. Lee J, Lee EY, Park EJ, Kim ES. An alternative treatment option for a bony defect from large odontoma using recycled demineralization at chair side. J Korean Assoc Oral Maxillofac Surg 2015;41:109-115. Vengal M, Arora H, Ghosh S, Pai KM. Large erupting complex odontoma: A case report. J Can Dent Assoc 2007;73:169-73. Wood NK, Goaz PW. Solitary radiopacities not necessarily contacting teeth. In: Wood NK, Goaz PW, editors. Differential Diagnosis of Oral Maxillofacial Lesions. 5th ed. St. Louis: Mosby; 2007. p. 492.